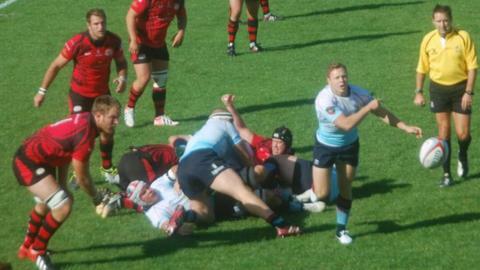 Jersey remain rooted to the bottom of the Championship after a fifth straight defeat, losing 29-19 to Bedford Blues. Blues led 22-0 at half-time after tries from Paul Tupai, the impressive Mark Atkinson and flanker Sacha Harding. A penalty-try wrapped up a bonus-point but Jersey hit back through Glenn Bryce and Nathan Hannay. Bedford's Ricky Reeves was sent off before Ed Dawson ran 60 yards to score and give the hosts hope of a making a comeback that never materialised. Despite the extra-man advantage and pressure on the visitors' line the islanders were unable to find a fourth try which would have given them two bonus-points. The win puts Blues back in second spot after briefly dropping to third after Friday evening's matches. Although they remain unbeaten, director of rugby Mike Rayer was not happy with his side's display. "It was a desperately disappointing performance from us," he told BBC Radio Jersey. "We were pretty woeful at times today and if they [Jersey] had taken their chances in the first half they should have won. "They were the better team and we were lucky we took our opportunities when we did." The islanders have just one point to show from their opening five matches, but their 19 points in a row in the latter part of the game showed they are not completely out of their depth at Championship level. It was a spirited second-half display from the hosts and with Reeves off the pitch for an illegal tackle on Hannay the crowd of 2,071 was treated to a lively conclusion. "Unfortunately it's happening in the last 30 or 20 minutes and we're leaving it a bit too late," said Jersey skipper Hannay. "Week by week we're getting stronger and we're putting teams like Bedford under a huge amount of pressure. "Unfortunately we didn't get any points out of this game, but we definitely deserved something."